Eugenio Derbez is a Mexican actor/director whose new movie left everyone shocked, sad, crying with happiness and full of wonderful emotions. 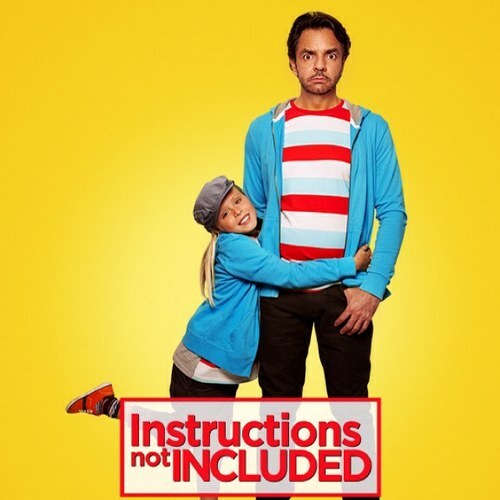 “Instructions Not Included” broke the box office record the day it was released. This is a movie for everyone, whether you speak English or Spanish the movie has subtitles to follow along with. In fact, even if you do not speak Spanish and there where no subtitles you could understand it because it’s half English and the actions shown are so well acted out that you could understand it even if it were a silent movie. The movie starts off in Acapulco, Mexico and a young man, who is played by the director himself, Eugenio Derbez, as a womanizer who fears compromise and children. When he least expected it he becomes a father to a beautiful baby girl, played by Loteta Paralta. He panics and crosses the boarder to look for the little girl’s mother. When he makes it to L.A he isn’t able to find the mother but decided to stay with the baby girl since he wasn’t able to go back to his country because of immigration. As the baby girl grows up both father and daughter have an adventure but seven years later, both face a life changing surprise. It took Derbez 12 years to raise the money to get the film started on his own. It took so long because half of the movie was filmed in Mexico an most movies in Mexico cost about 2.5 million dollars to do, “Instructions not included” took about 5.2 million dollars to make. He planned every detail and wanted the movie to be just the way he envisioned it. The movie itself has made 38.6 million dollars in the U.S. box office alone. When the movie was released in parts of Latin America the prediction was that it would double if not triple what the U.S. box office made. Because it shows certain aspects of Derbez’s life, many families can relate to the film to show how being a parent is not easy. This film knocked “Pans Labyrinth” aside. When “Pans Labyrinth” was released in 2006 it made 37.6 million dollars, due to the fact that it was in Spanish. Its an emotinal well thought out story, it brings families closer together more than expected. Its a father daughter film, but overall it’s about how one little baby girl will change a ma’ns life forever. It will affect you, make you cry and leave you with an aching heart that in a strange way will be full of joy. Derbez tries to do right through his daughter, like by getting a job as a stunt man and his daughter being his translator/manger they both go through a journey that impacts them dearly. Derbez truly shows his comedian and fatherly side in the movie, all of his personalities come to play throughout the entire film. The surprises that come along with the film will slowly come together like pieces of a puzzle. It might have taken a very long time to finish the movie but it was worth it, Derbez took a risk to make his dream movie putting every penny he had into the film, but in the end the movie was a hit and he came out on top.